Richard Dees (Miguel Ferrer) is a supermarket tabloid reporter for a rag called Inside View. He’s an aggressive scumbag, but he’s good at his job. Dees is offered a story about murderer going by the name, Dwight Renfield, who is flying from small airport to small airport and killing everyone in the place. At first, Dees isn’t interested, but after the story is offered to a young reporter, Katherine (Julie Entwisle), he decides to take it. Following up on the previous murder scenes, Dees learns the attacks were unusually violent, and even involved blood drinking. Dees and Katherine get closer to catching up to Dwight, but he might prove to be exactly what they suspect him to be. At the outset, a story about a vampire flying to small airports to eat people seems kind of silly. It’s the kind of story that works best in written fiction because you can more easily delve into the inner lives of the characters. You can draw out their reasoning, and insight into the characters can help create something that has verisimilitude. So, it’s a minor miracle that this low budget made-for-HBO movie manages to make this story work and work well. Ferrer has always been a pro at playing acerbic jerks and Dees is no exception. The film knows when to play coy, or be arty, and when to use gore for maximum impact. The vampire design is a fusion of traditional and something more bestial. 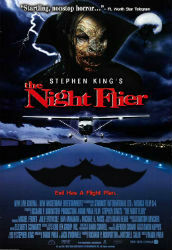 Night Flier is great little vampire movie.